"Smoking is such a bad addiction for some people and they need somewhere to turn when they are ready to quit. That's why here at Phillip Morris USA we want to provide that help for people who are addicted to cigarettes. Yadda yadda yadda." Can you recall seeing the Marlboro Man growing up? Does anyone else see the slap-you-upside-the-head irony in all of this? This is Phillip Morris USA we are talking about here. You know, of Marlboro Man infamy. I can remember that ever-so-clever image PM attempted to portray of people who used their products -- calm, cool, and collected. This was supposed to be the "perfect" man, right? Ha! Sure, PM put Marlboro Man away a few years back when they got sued and lost for causing people to get lung cancer, emphazema and heart disease. They even ADMITTED as much in an attempt to show contrition. While the days of flaunting smoking in the public eye in radio, television and even billboard ads are long gone, the marketing machine at PM isn't run by a bunch of dummies. They know if they can APPEAR to care about public health that they won't be looked at as evil. Thankfully, I never once in my life felt even remotely tempted to smoke even once in my life because the stuff just looked nasty to me. Unfortunately, that wasn't the choice that many others have made over the years and now they're addicted to those same products that they once thought they wanted to use to fit into the image of their dreams. So how do they stop this awful habit? Dum-duh-duuuummmm! Phillip Morris to the rescue! In a "voluntary effort" they have undertaken called Quit Assist (I'm not kidding! ), they are attempt to "connect smokers who have decided to quit to a wealth of expert quitting information from public health authorities and others." "Smoking causes serious diseases and is addictive," the Quit Assist web site created by Phillip Morris states. "It can be difficult to quit smoking and many smokers who try to quit do not succeed. We hope that this QuitAssist resource will help smokers who have decided to quit be successful." Smoking is harmful, eh? Ya think? This little public service announcement and effort by Phillip Morris to look "responsible" is nothing but a big charade to cover up the fact that they are making billions of dollars off of people ruining their health using their products. Why would Phillip Morris want and even encourage people to STOP buying their product?! That doesn't make any sense at all. Yes, I am opposed to smoking because I think it is as much a problem with health as the lack of exercise and obesity is. In fact, let's look at an analogy to this "stop smoking" ad being run by PM for just a moment using another popular company making products that are unhealthy for consumers and what a similar campaign would look like with them. This PM ad would be just like McDonald's running a 30 second spot on the radio encouraging people who are overweight or obese to please visit their web site to learn more about how to eat healthier. Oh, wait a minute, they already have -- CHECK IT OUT! YIKES! Are they serious?!?! While McDonald's has never openly advertised this aspect of their web site, they most certainly are getting on the same bandwagon as Phillip Morris with their "food, nutrition and fitness" page. "McDonald's range of high-quality foods can fit into a balanced diet," the McDonald's web site exclaims. ROTFL! "High-quality foods" at McDonald's. Hee hee! Yep, them fries are only cooked to a golden brown in the highest quality of cooking oil, right McDonald's? Sheez, what a freakin' joke! And the "balanced diet" crap they spout off about the nutritional content of their food is about as useless as having low-fat lunatic Dr. Dean Ornish providing health tips to their customers. The point is that companies like Phillip Morris and McDonald's would NEVER (and I mean NEVER!) jeopardize a good thing when they are making a lot of money off of ruining the health of the general public. They DON'T CARE because they are rolling in the dough in the process. So what if a few people die here and there from heart disease, stroke, or cancer? That's just the price of doing business in a supply and demand world, right? If these companies were truly concerned about the health consequences of people smoking or eating too much fast food, then they would shut their doors and urge people to live healthier lives. "Breathe more clearly and stop smoking forever." "Live longer and stronger by losing weight on a diet rich in fruits, vegetables without overconsuming sugar, white flour and other process refined carbohydrates." Can you imagine if these companies took a stand like this what kind of impact it would make? And yet THOSE are the exact messages that need to be heard, not these mamby pampy empty ones from companies who are still in the business of making money while destroying people's health! That's not all of the misleading marketing ads going on right now regarding healthy living. Have you seen the new milk television ads? You've seen them showing off that hourglass-shaped milk glass and the proclamation that "people who drink milk are among the thinnest and healthiest people in the world." They've even set up this web site to urge people to have at least three servings of milk each day. Okay, fine, eat three servings of milk and milk products daily, which includes cheese (a low-carb food!) by the way! But this business about drinking milk being more conducive for losing weight is just plain ridiculous! The fact is that milk, fat-free, 2% or otherwise, is much to high in carbohydrates for people on a carb-conscious diet to ever consider adding to their menu of food choices. That's why there are excellent low-carb milk alternatives like the Carb Countdown products made by Hood. The other thing this milk ad mentions is to choose the low-fat or fat-free versions of milk, cheese, yogurt, etc. as part of your healthy lifestyle. NOT! If I am going to eat cheese, it's definitely NOT going to be the tastes-like-soft-styrofoam fat-free cheeses they try to fool people into buying. Nope, I'm getting the full-fat real deal cheese, baby! That's the only way to eat it and get all the healthy benefits you need from it when you are livin' la vida low-carb. Subway's mantra is "eat fresh" -- what does that mean?! Finally, this one has been around for a few years, but I notice they STILL use it today. It's the slogan from Subway -- "Eat Fresh!" What the heck does that mean? My wife really hates the ones on TV right now featuring John Lovitz in a robe barking that slogan at the end. LOL! It is pretty obnoxious. Trust me, you'll know the one I'm referring to. Anyway, "eat fresh"...ooookay, what's "fresh" about it? And does "fresh" have anything to do with being healthy? Just look at what they serve you -- t's processed meats and cheeses put on a carbohydrate-infested sandwich bread. Sure, Subway sponsors the American Heart Association's Heart Walk urging people to get more active and that's a very good thing. But anyone who thinks eating Subway sandwiches everyday is gonna help you get thinner and stay thinner is fooling you. Sorry Jared! Unfortunately, misleading marketing ads like these DO have an effect on the public whether we realize it or not. It is sad that so many people don't do the research for themselves to test the accuracy of what they hear in radio and television ads. They just buy into the marketing at face value which brings a big smile to these companies who spend millions of dollars creating a certain public image for and about their products. If more people would stop doing that and start calling the bluff of these companies when they try to "act responsibly" by showing how much they care about the consumer, then maybe, just maybe, we could see real change occur. Until that happens, it'll be business as usual. That means more misleading garbage ads about how much a company cares about your health are forthcoming. Can you see what's coming next -- Pizza Hut Announces A New Pizza That Contains Foods From All Five Of The Major Food Groups! Don't laugh, it could happen! And probably will, too! Many years ago, a few decades ago, Subway was much better. Now they go for the lowest common denominator to keep their prices "low". Then they bake bread on the premises and say "fresh!" as if it would make up for the fact that the underlying dough tastes like nothing and is likely low on fiber and nutritive value. "Marketing" by large corporations is killing our civilization and our health. But what really confounds me is that where I live, in New Haven, Connecticut, we have about thirty pizza and sub shops for every ten miles of road, and they are all authentic, that is, they are run by third-generation Italian-Americans who use really good ingredients and recipes... and then some people still want to buy at Subway, Domino's, and Pizza Hut. 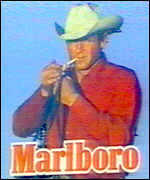 Speaking of the Marlboro man, didn't everyone know that the actor who portrayed him died of lung cancer? How do ya like dem apples?! COSTA MESA, Calif.- Wayne McLaren, who portrayed the rugged "Marlboro Man" in cigarette ads but became an anti-smoking crusader after developing lung cancer, has died. He was 51. McLaren, who smoked for about 25 years and was diagnosed with the disease about two years ago, died Wednesday at Hoag Hospital in Newport Beach. "He fought a hard battle," his mother, Louise McLaren, said Wednesday. "Some of his last words were: 'Take care of the children. Tobacco will kill you, and I'm living proof of it.'" Last spring, he appeared before a meeting of stockholders of Phillip Morris Inc., maker of Marlboro, and asked them to limit their advertising. He made other public appearances to warn about the dangers of smoking. His wife, Ellen McLaren, said letters arrived for her husband in his final week from people who pledged to continue McLaren's battle against smoking. McLaren, a rodeo rider, actor and Hollywood stuntman, was hired in 1975 to appear in Marlboro magazine and billboard ads, evoking a tough and handsome smoker's image for the brand. The Lake Charles, La., native once said he was a pack-and-a-half-a-day smoker for about 25 years. His advanced lung cancer was diagnosed in the spring of 1990. In an interview last week, McLaren said his habit had "caught up with me. I've spent the last month of my life in an incubator and I'm telling you, it's just not worth it." Subway does offer low carb options. You can skip the bread and have your "sandwich" on a salad with lettuce, spinach or both. They also offer wraps in the form of a low carb tortilla. I'm on the road a lot and they are essential to keeping me from having to settle for fries and something on a bun. The cigarette companies HAVE to air ads like that. It's some kind of a deal they made after being sued so many times. They don't WANT to do it; they are being FORCED to do it by the courts. Whether they are FORCED to run the stop smoking ads or not, it is very, very strange to hear that coming from a company that sells smoking products. The way they have crafted the wording of the ads, it makes it sound like they are doing something "responsible" with these PSAs rather than simply following a court order. That to me is even sicker than promoting their products to begin with! Of course they are putting a good face on it. If I were them I would too. They've done a good job at making themselves look good while furfilling their court-ordered duties! I've seen tons of comertials on TV just like the radio one you heard. Off topic...how di you do the audio blog? I have a microphone on my home computer. Can you tell me how you got started? Is it easy? Actually, Newbirth, doing the audioblog messages was SUPER easy -- all you need is a telephone that can dial long distance and you're in business! I use my cell phone because I get long distance for FREE and I don't have long distance service on my home phone. The quality is not as good as it would be, but you can't beat the price -- N-O-T-H-I-N-G!!! Here's the link to sign up: ! Ok, I did it...OIf to my blog to see how it did. It's only like 5 seconds long, lol! Woot! It worked! That WAS super easy, thanks. I also did it from my cell phone simply because I'm not home at the moment, but that 415 area code is pretty local to me - it's San Francisco!